This happy little party monster will find its way to my little great niece. This little monster is eager to party! To add some dimension to the card, the monster has a shiny (or slimey!) covering from the Fine Tip Glue Pen and the balloons are at various depths. I first stamped the monster and the balloons with Basic Black Ink. 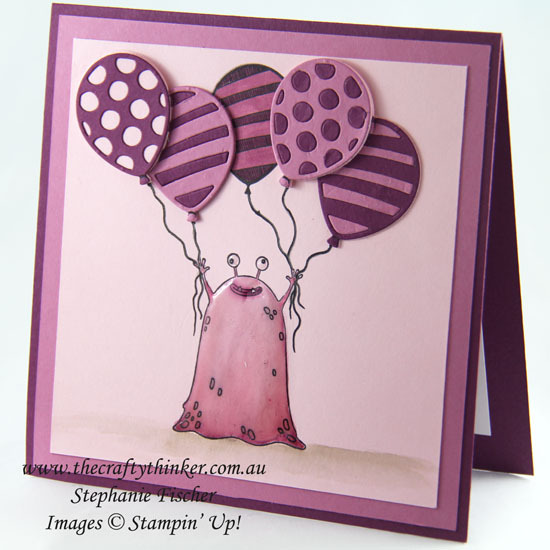 I coloured the middle balloon with Sweet Sugarplum and Rich Razzleberry Stampin' Write Markers. I then punched a whole lot of balloons with the Balloon Bouquet punch using Pink Pirouette card so that the edges would blend in with the card front. Working on the two lower set balloons first, I put some Multi-Purpose glue on the stamped balloon image and placed a punched balloon on top. Then I adhered another punched balloon on top of that. 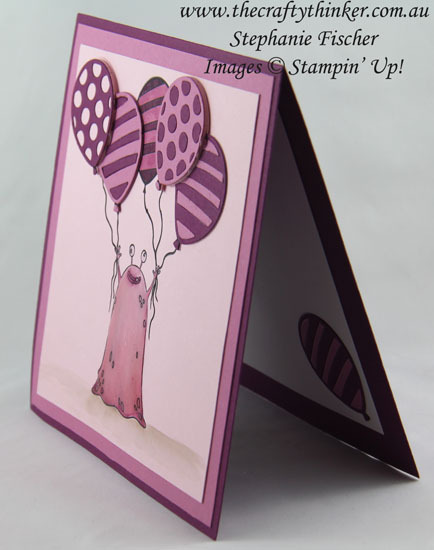 I then used the stripey balloon die from the Balloon Pop Up Thinlits and cut one with Sweet Sugarplum and one with Rich Razzleberry card. I placed glue all over the top layer of punched balloon and added the decorative balloon pieces. Once the glue had had a chance to dry sufficiently, I carefully cut away the part of the balloon that overlapped the neighbouring balloon. I then repeated the process with the topmost balloons but added more layers of punched balloon. I hand drew the strings.